Romance isn't romance without candlelight which explains why candles have been gracing tables at wedding receptions for such a long time. Now, however, they're becoming increasingly popular as part of the marriage service, blending their religious connotations of light and hope with the symbolism of a 'unity candle' ceremony. Here's some tips on using candles for maximum effect. 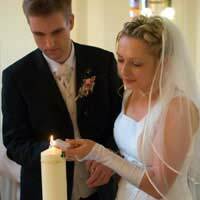 A unity candle is a single pillar candle (the thick, straight-sided type often seen in a church), which the bride and groom light to symbolise the joining of their separate lives. The main candle is put in a special holder and flanked by two slim 'taper' candles, used to light the bigger one. The candles are usually placed on the altar for the ceremony, which begins when members of the bride and groom's families - usually their mothers - light the taper candles, signifying the happy couple's lives up until their marriage. The bride and groom then each take one taper and light the wick (or pour the sand) to cement their union. Attractive alternatives to the conventional wax candle ceremony include using an oil candle, a container of oil with a floating wick, which can be lit with tapers in a similar fashion. It's also possible to dispense with the taper-lighting altogether by using a sand candle, and creating two smaller loads of sand that the bride and groom pour into a central container. If you're having a civil ceremony and want to include a candle, make sure your venue will allow it - some places have rules governing the use of naked flames. It's also a good idea to invest in an oil candle or a special 'smokeless' candle, which will minimise the amount of smoke that collects in the room while the candles are burning. 'Dripless' candles are also available to cut down on mess. Centrepieces featuring candles are an easy and elegant way to brighten up your reception tables. They can be used in a huge variety of different ways - as well as the typical straight taper emerging from a floral arrangement, try putting short pillar candles in coloured glass containers or floating a handful of tea lights alongside flower petals in a bowl of water. Your florist will be a good source of suggestions, and may well be able to supply candles and containers as well as your flowers. Candles were originally invented to provide light, and there's no reason not to use them for the same purpose during the celebrations. Fit your candles (tall candles are best for this purpose as they'll burn longer) into candelabras, wall sconces or even wine bottles and place them around the room. For a contemporary look, put church candles into large, transparent glass vases - the bigger the better. Words of warning - if you're using anything flammable in your arrangements, such as artifical flowers, fireproof them with a spray solution before lighting the candles. And whatever you do, make sure the bases of containers are large enough to catch any wax drips that might upset the tablecloth cleaners. Want to add an extra personal touch to your decorations? Whether you're after a particular colour, decoration, name or message on your candles, look out for specialist Internet sites that'll make candles to your specifications. Try using candles for more than just decoration. For example, if you're after a special way of marking the absence of people who couldn't attend the wedding, order a candle featuring details about the absentees and light it during the reception in a position where everyone will be able to take note of it. Finally, why not give your guests a personalised candle to mark the occasion of your marriage? Have your names and dates added to candles, then package them up in voile bags, tins or boxes and hand them out to guests before they depart. Pretty and practical - what more could you ask from a wedding favour?